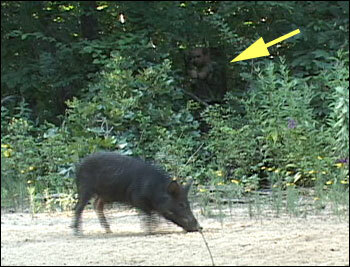 On the last afternoon of our hunt I decided to stick with the technique of ambushing the hogs on the trails leading to the blinds. 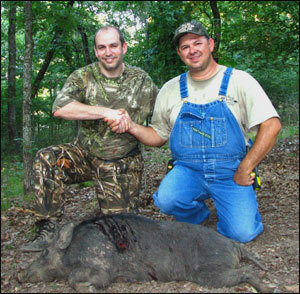 I had set up my camera on the far side of the road in an attempt to film both me and the hog in the same frame (like the last hunt, only from the opposite angle). The setup worked like a charm. A nice group of hogs moved in only moments after setting up but one of them saw the camera and the group took off before I could get a shot. But one lone hog came back and provided me with a great shot. I drew my bow and shot him dead center in the lungs - he dropped on the spot. This was odd because he acted like he was spined? 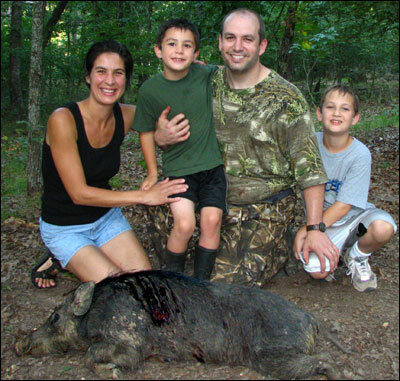 As it turned out, I had spined him - I had forgotten what Cheryl had told me about hogs, their lungs are much lower than a deer and the spine turns down sharply into the chest. The arrow penetrated the spine - dropping the boar in it's tracks. My kids came up to congratulate me. The "crew" went 100%. We had three nice meat hogs going home. That night we headed into town with Matt and Cheryl to celebrate a fantastic hunt. My kids were already discussing dates for our return trip and asking me why we can't do this every month? Matt and Cheryl were great. While I had known both of them since the mid 90's - Julie and I really got to know them well on this trip and can honestly say they are terrific people who run a fabulous operation. I'm sure those of you whom have hunted with Shiloh will agree. We hope you enjoyed this special live hunt. 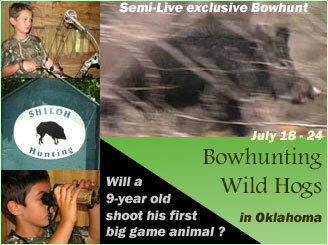 Look for more live hunts in the upcoming months. This family hunt is sponsored by these fine companies..